A wall gun safe may just spell the difference between successful repelling a burglar’s attack, or an unfortunate thing happening to you. This type of gun safe is what you typically see in the movies, hidden behind mirrors and frames. A hidden gun safe is particularly designed to give the gun owner an advantage in case of a home invasion because he or she knows where the gun is stored. You shouldn’t fall into a false sense of security thinking that burglars will spare your house. In the United States, about four burglaries happen every minute. That alone is a scary stat that should prompt you to look for an in wall gun safe. One of the most important considerations in choosing a wall gun safe is the capacity of the unit. You should consider the size of your weapons as well as the other accessories that you would store there. These include magazines and other important items like documents, jewelry, and spare keys. You should not only consider the sizes of your current weapons. You must also anticipate the firearms that you will likely acquire in the near future. The last thing that you want to happen is buying a small gun safe not and then needing another one after a couple of years. It’s better to buy a large hidden gun cabinet now than buying another gun safe after 1-2 years. Your wall gun safe may be hidden well from prying eyes, but if it doesn’t have a good fire rating, then it can easily be gutted by fire. 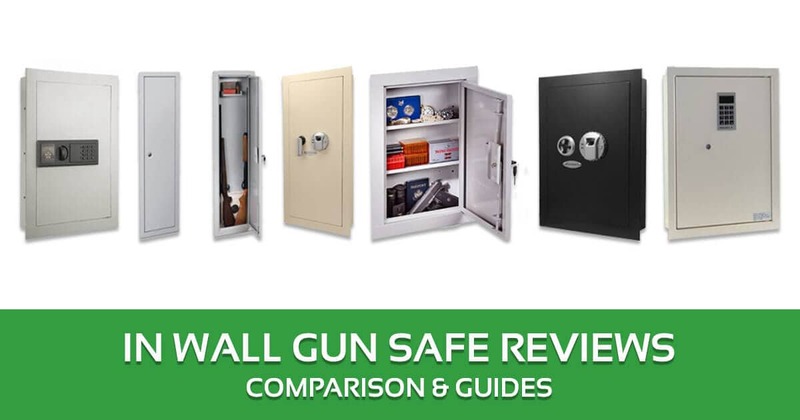 In choosing a wall gun safe, buy one with a one-hour fire rating at the minimum. This means that the fire safe can withstand fire for one hour. 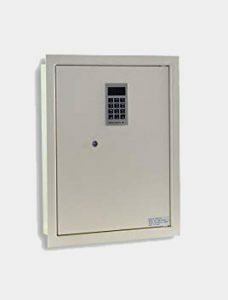 Moreover, a fireproof wall safe should need at least 15 inches of space behind the wall. Check with a pro first if there’s enough space in your wall for that. A fireproof wall safe is heavier and more expensive, but it’s a good investment in the long run. Just like in choosing any other type of safe, you will have to choose a locking system that you are most comfortable with. Each type of lock has its own advantages and disadvantages, so it is really up to you to decide the kind of lock you want to go with. You can opt for a digital lock, which is the fastest to access especially with large and clear numbers on the keypad. Similar to biometric scanners, the downside of using a digital lock is that you have to change batteries every now and then. Dial combination locks are reliable as well and require no changing of batteries, but it may be hard to use them in low lighting conditions. Key locks are also still available, but you run the risk of having another person find and use the key. Extra features can be the deal breaker if you are in a quandary on which gun safe to choose. For instance, a wall safe with expandable shelves for additional storage space may be a more practical choice if you think you’ll be buying another gun in the next few years. If you’re too concerned about your weapons being protected against dust and corrosion, a velvet inside can be a good choice. You can also opt for a gun safe with a humidifier that safeguards your weapon and ensures that it would be in excellent condition for years to come. Wall depth: if you’re looking to install a fireproof or fire resistant wall gun safe, then your wall should have a depth of at least 15 inches. This wall safe has a fingerprint reader that can read and store up to 120 different fingerprints. This is so helpful because you can store various versions of your fingerprints from different angles. This, in turn, can make the safe a lot more accurate when it comes to reading your fingerprints. Another advantage of this biometric fingerprint technology is that you can store fingerprints of other people in your household. You can have your spouse, brother-in-law, or other adults living with you program their fingerprints. The interior of the wall gun safe is pretty spacious with dimensions of 19 inches x 13.75 inches and 3 inches (height, width, and depth). You can store 3-4 handguns inside this safe along with ammunition. It is also spacious enough to accommodate small valuables like passports, spare keys, and USB drives, etc. It also has a couple of internal shelves that are removable for added storage. This gun safe is designed to be mounted on the wall as there are pre-drilled holes inside it. Its width is small enough to fit between typical wall stud spacings. It also has fitting instructions for DIYers. You should be able to mount this easily as long as you follow the instruction manual. There are other features that you will like in this wall gun safe. One is that you can mute the audio beeps, which is important if you don’t want an intruder to realize that you are opening the safe. There’s also an external battery pack for accessing the safe in case the batteries inside run out of power. Advanced biometric fingerprint technology that can recognize and store up to 120 different users. Can be hidden behind picture frames, mirrors, furniture. This is one of the best in its price range. The Paragon 7750 is an affordable, electronic wall safe that has two locking mechanisms. It also is durable being made of 1/8 in thick solid steel. There are two locking mechanisms in this wall gun safe. It can open by keying a secret PIN code, or using the supplied keys. With two options to unlock/lock the safe, the chances of you failing to open this safe are very, very slim. You can combine three to eight numbers as your secret PIN code in this gun safe. You can change PIN codes as many times as you want. The keypad has LED so that you can see it even in the dark. Now in case you forgot your PIN code, you can turn to the 2 keys supplied by the manufacturer to open the safe. This is a strong and sturdy gun safe as it is made of 1/8 inch stainless steel. It also has inside-tamper proof hinges, which should make it very difficult for even a clever burglar to open this gun safe. Plus, burglars won’t be able to notice it as it has a one-inch frame around the front to conceal lines. Another advantage of this gun safe is that it is very easy to install. You don’t even have to ask for professional help to mount this on your wall. There are pre-drilled holes that should make things easier for you. 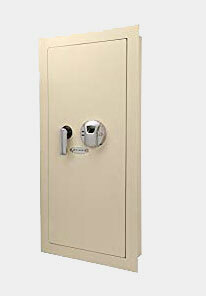 Finally, this safe is backed by a long, 10-year warranty which is one of the best in its class. Sure, this is an entry-level in-wall gun safe, but that doesn’t mean that it is a run-off-the- mill variety. After all, it has met the stringent standards set by the California Department of Justice. It is made of heavy gauge sheet metal with the quality brass lock. The hinges are enclosed and protected. The safe itself isn’t fancy but is generally of decent build quality. This gun safe should have adequate space for a couple of handguns. There are removable shelves inside so you can adjust them according to your storage needs. If you need to store a rifle, simply remove the shelves. It can hold two rifles that are up to 52 inches long. There are also foam inside this safe to protect your weapons and other valuables from scratches. This safe is backed by a three-year warranty. 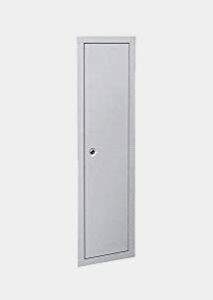 This is another reasonably priced in-wall gun safe that has very decent features. This wall gun safe proves you don’t have to spend too much to be able to have the best gun safe for your needs. For one, this in-wall safe is sturdy and crowbar-proof. The door made of steel is around 5/8”inch thick. It is also very easy to install, and you can easily put it behind a mirror or picture frame to conceal it. The digital locking system is also top notch. You will need to key in your four-digit passcode to be able to unlock this safe. In case you forgot the code, you will have to key in a six-digit override code. If you fail again to supply the override code, you can turn to the supplied keys in opening the safe. The digital keypad is flush, and you won’t have any problems in inputting the code even in the dark. The keypads are nice to touch and look durable as well. Once you open the safe, the door springs open to reveal the interiors of the box. The door opens to the right. There’s a LED backlight that illuminates the interiors. You can put up to four handguns in this safe, as well as other valuables like jewelry, cash, and check. There’s a felt line shelving that protects the weapons, jewelry, watches and other valuables against scratches. This is a safe that is easy to install, with most reviewers on Amazon.com saying they were able to mount it on their wall in less than an hour. This is definitely one of those in-wall gun safes that give the most value for money. This is another example of a cheap in-wall gun storage that should be enough for budget-conscious gun owners. It’s not really a safe per se, but a cabinet so doesn’t expect it to have a sophisticated locking mechanism. It’s not even made of thick metal. But it should do a decent job of keeping your weapons away from your kids’ reach. This gun cabinet is made out of sheet metal. It isn’t the sturdiest in this list, and determined burglars will be able to open it eventually. But as far as preventing nosy relatives from accessing your pistols, then this cabinet should be able to do its job. It has a three-point locking system on the door, allowing you to secure it from either the side, top, or bottom. It’s not fancy at all but should be enough to keep your rifles away from burglars and even from your kids. It extends to the top and bottom of the cabinet, so it is more complicated than a simple lock. Inside, there’s enough space to store large rifles. You can store at least two rifles up to 52 inches long inside this safe. It has three removable steel racks that would let you secure your magazines and weapons accordingly. There is cushion at the base of the cabinet to protect your weapons. There are lots of pre-drilled holes for securing the cabinet into the studs. You can install this cabinet by yourself. This is a solid choice for gun owners who are willing to spend more for their weapons storage. It features an advanced biometric fingerprint scanner that can store up to 120 fingerprints. With so much memory in the scanner, you can have your fingerprints scanned in different angles. It further makes the biometric fingerprint scanner less likely to read your fingerprint and reduces the risks that you are unable to open the gun safe in case of an emergency. Moreover, you can have other adults in your household store their fingerprints on this scanner so they, too, can get your weapons just in case of an intrusion. There are also a backup set of keys that you can turn to in the unlikely event that the biometric scanner fails to read any of the registered or stored fingerprints. The interior of the gun safe isn’t the most jaw-dropping, but it should be enough to store several handguns. Its interior measures 31.5 inches in height, 15.5 inches in width, and 3.8 inches in depth. There’s a LED light that lets you see your weapons even in the dark, which is important during a break-in at night. There is also a movable shelf inside allowing you to adjust the storage options according to your preferences and needs. 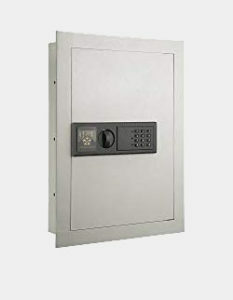 The safe itself is mad of solid steel with motorized deadbolts for increased level of security. 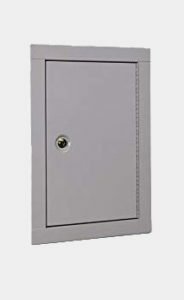 Despite weighing 48 pounds, this safe should not be very difficult to install into your wall. There are large flanges that can help you in making a secure installation. The lack of foam inside the safe may be particularly worrisome for gun owners who want to protect their weapons against scratches, but that is admittedly a small chink in the armor of this good quality in-wall safe. There are several reasons you should own an in wall handgun safe. Here are a few of them. Guns are dangerous. You need to ensure the safety of your loved ones and a hidden wall gun safe can do just that. Accidents happen, but you can reduce the chances of them happening by being vigilant. A wall safe keeps your guns out of the hands of curious children. Avoid tragic events by placing your guns in a secure safe. Place it somewhere hidden and out of reach from younger hands. Guns are expensive. Even a single gun will cost you several hundreds of dollars, if you take into account maintenance tools and more. It can get even more expensive once you start buying rifles and more. You do not want something that expensive to end up stolen. This is why an in wall rifle safe is a good idea to help protect your firearms. This is especially so when the safe is a hidden one. Some states have laws about the storage of guns. You do not want to end up with a fine for not properly protecting and storing your firearms. First, there are child protection laws in over 27 states and the District of Columbia. These laws state that you should lock away guns so that children would not have any access to them. Second, over 11 states and the District of Columbia require you to lock up your guns. The penalties for this law can reach up to criminal prosecution. An in wall gun cabinet, like any other piece of furniture, requires proper maintenance. This is to ensure that they function well. Here are a few tips on how to do just that. With these tips your gun safe should remain in tip-top shape for a long time. An in wall gun safe, like a between studs rifle safe, may not look like much, but you’ll want it to look great when you pass by. Layers of dust and dirt make you look like a negligent owner. This is why you’ll want to clean them on a regular basis. Get a duster or a soft cloth and wipe away all that dust once a month. You don’t want to use abrasive material for cleaning the safe or you will end up with scratches. Your safe should look great to anyone looking at it. It is more than dust you need to be careful of. Constant use will leave its mark on your safe. Your hand will leave fingerprints, while dirt can build up on the exterior and the moving parts. Use a soft cloth and a cleaning formula to wipe all of these away. Finish it off by drying it with another piece of soft cloth. Gun safes may not have many moving parts, but what they have is important. Those hinges ensure that you can open the safe quickly and smoothly. This is why you need to oil them regularly. Apply oil to all parts of the hinge: top, bottom, and the sides. When this is done, wipe away the oil with a clean cloth. Is new or used better? One of the first things you’ll notice on the market is that there are a lot of people selling used gun safes. It can be tempting to purchase one because of their price. However, used gun safes tend to be old and are on the market for a reason. Go for new to be safe. Do I really need an expensive gun safe? Price is not an accurate measure of quality. You also might consider what your main purpose for it is. If you just want to keep you guns out of children’s hands, then a cheap one should be good enough. If you want extra security, then a more expensive safe would be a better choice. How big does a gun safe have to be? It depends on the size of your guns. A safe for a handgun collection does not need yo be big, while a long gun wall safe should comfortably house long rifles. What sort of lock do I need on my safe? Dial locks and electronic locks are the two popular choices right now. A mix of the two ensures maximum protection for your guns. How do I properly hide my gun safe? Knowing how to hide a wall safe is a simple skill. Just put it behind a piece of furniture or wall hanging in an easy-to-reach area. This ensures that you have a combination of safety and accessibility. Think of an in-wall gun safe as an added protection to your home. With an in-wall gun safe, you are minimizing the chances that your kids will be able to access and get hold of your handguns and pistols. More so, it can give you the advantage over an intruder who doesn’t have any idea that you can repel his attack using a weapon that you stored in a hidden wall gun safe. 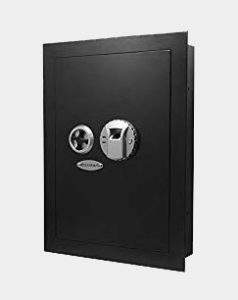 There are many in-wall gun safe models available in the market, but the six gun safes mentioned above are highly recommended given their outstanding features, strong frame/construction, good locking mechanism, and reasonable prices. I bought two safes the Stack-On IWC-22 In-Wall Cabinet and the Protex Wall Safe with Digital Keypad after some googling. This review was helpful in choosing these models having learnt of their affordability and safety design. One is for my sister and another is helping me keep my home guns. I don’t have any problem with them so far.